Descendants of the early Portuguese Catholics built the first Santa Cruz Church in 1770 after the fall of Ayutthaya. The Portuguese, the first Europeans in Siam, arrived in Ayutthaya shortly after they captured Malacca in 1511. As the region was in the trading area of Ayutthaya, the Portuguese shrewdly dispatched an envoy to the court of Ayutthaya in the same year to reassure the king that Portugal had no further territorial ambitions in the region. In 1516, Portugal signed a treaty with Ayutthaya to supply firearms and munitions. With the treaty came with the rights to reside, trade and practice their religion in Thailand. This brought the first Portuguese friars in 1567 who established the Catholic Church in Ayutthaya. After the fall of Ayutthaya in 1767, the Portuguese continued with their military support to King Taksin in his efforts to drive the Burmese out of Siam. 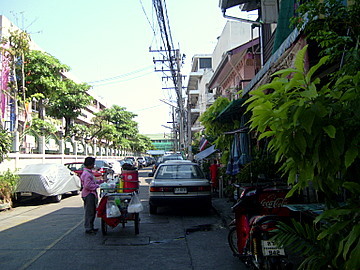 The supply of mercenaries, cannon and muskets contributed significantly to King Taksin’s army. With Ayutthaya destroyed, the Catholics from the old city moved south to start a village by the Chao Phraya near Wang Derm, King Taksin’s Palace. In recognition of their services, King Taksin granted the Portuguese a plot of land to build a church. This grant was made during his royal visit to this village on 14 September 1769. 14 September is of religious significance to the Catholic and Orthodox Churches. On this day in 326 AD, St Helena, mother of Roman Emperor Constantine, the first Christian emperor, made a miraculous discovery of the Holy Cross during a pilgrimage to Jerusalem. The day has been designated the Feast of the Triumph of the Holy Cross. For this reason, the church was named Santa Cruz (Holy Cross). A wooden church was completed on 25 May 1770. Please see map to the church. Over the next 65 years, the wooden church fell into a state of disrepair. In 1835, Cardinal Pallegoix built a second church to replace the wooden one. Apparently this church had a rather Chinese design. So the villagers named the church “Kudi Jeen” or Chinese church. For this reason, the community that grew around the church became known as Kudi Jeen. 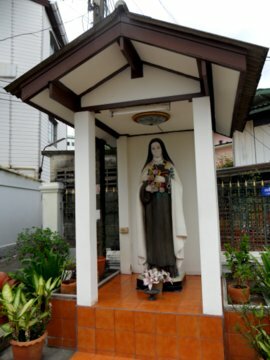 Santa Cruz Church is sometimes referred to as Wat Kudi Jeen. 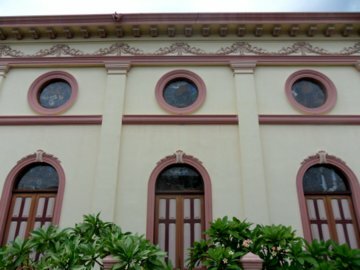 In 1916 the third and present version of Santa Cruz Church was built during the reign of King Rama VI (1910 – 1925). The two renowned Italian architects Annibale Rigotti and Mario Tamagno took on this task. 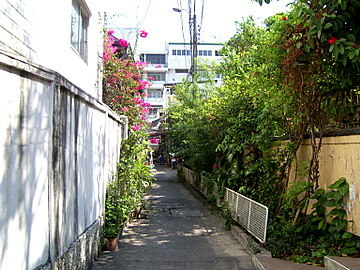 The gate to the spacious courtyard is a short distance from the Chao Phraya River. 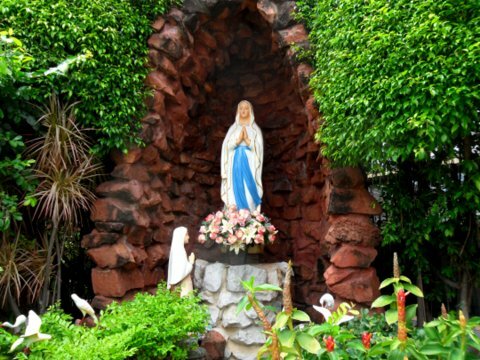 A crucifix is in one corner of the courtyard and a statue of Mary within a beautiful garden in the other. Looking unto Jesus, the author and finisher of our faith; who for the joy that was set before him endured the cross, despising its shame, and set down at the right hand of the throne of God. Within a smaller courtyard, surrounded by a low wrought iron fence, stands the neat cream colored church trimmed in reddish-brown and topped by a domed belfry. 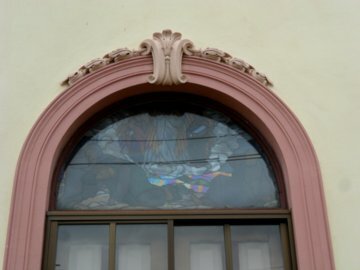 The sidewalls of the church are decorated with stained glass etched with biblical images. To the rear of the church, away from the Chao Phraya, there’s a small cemetery with tombstones encased in marble. From the names on the tombstones, it’s apparent that these are the graves of former pastors of the church. In the outer courtyard behind the church, the statues of Mary and Joseph stand like guardian angels over the Kudi Jeen community. The church grounds are accessible to the residents in the area who walk through the courtyard to get to the river. The gate between the church and Soi Kudi Jeen was opened during both my visits. 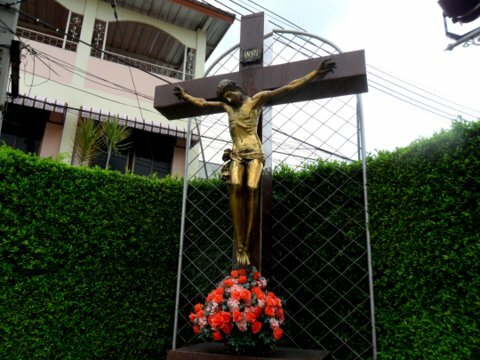 Like the early Catholic churches in Thailand, Santa Cruz Church continues to play a major role in education. 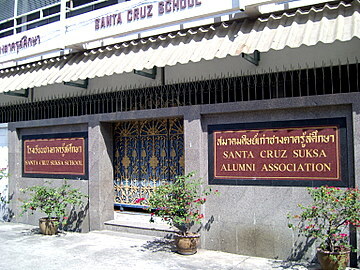 Two schools were built around the church; Santa Cruz Suksa School and Santa Cruz Convent. The convent was started by the Sisters of Saint Paul of Chartres in 1906. The well-kept church grounds are quiet on weekdays save for the rhythmic strains of children reciting their lessons in the Santa Cruz Suksa School nearby and the occasional passerby on the way to the river. Like an urban oasis with narrow sois (lanes) leading to the busy streets outside, the Santa Cruz Church is all that remains of Portuguese influence in Kudi Jeen today. 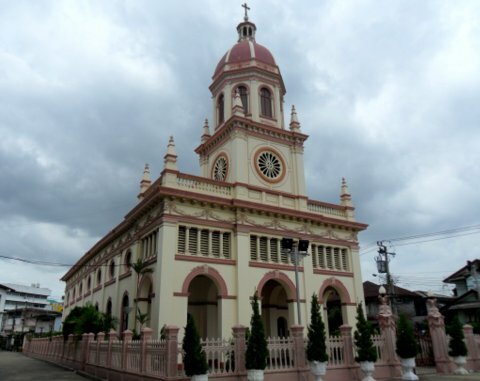 Santa Cruz Church is also known as Wat Kudi Jeen (Wat Santa Cruz on the map) after the community living there. 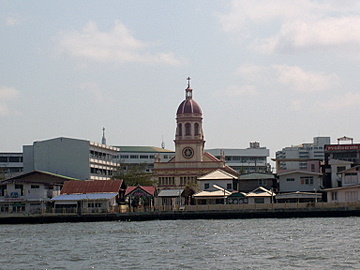 The reddish dome of the church is the prominent landmark in the area. You can't miss it. The easiest way to get there is by the Chao Phraya River boat to N6 Memorial Bridge (Saphan Phut in Thai) and walk through Pak Klong Talat (fresh flowers and vegetable market) to the Pak Klong Talat ferry pier. Express river boats don’t stop at N7 Rajinee pier which is near the Pak Klong Talat ferry pier. For more on the regular river boat services, please see Chao Phraya River piers. From Pak Klong Talat ferry pier take the ferry to the Wat Kalaynamit pier. Please note that the ferry no longer berths at the church pier which has been dismantled. From the Wat Kalayanamit pier the walk to Santa Cruz Church is about 100m. You will pass the Kuan Yin Shrine along the way. 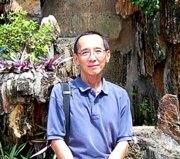 While you are there, visit the Kuan Yin Shrine as well. The one-way fare is 3.5 baht from Pak Khlong Talat – Wat Kalayanamit.The fare is collected at the Pak Khlong Talat Pier before you leave and on your return. For other Bangkok churches and Bangkok communities.